The single greatest priority for the Bush administration has been the consolidation of executive power. That power has been wielded like never before for partisan gain: to win current and future elections for Republicans across America. The Democrats had everything going for them in the 2006 election, but all the obstacles Republicans have been constructing paid off by denying them an even bigger win. Democrats are confident going into 2008, but the Republican advantages endure. Through a rigorous examination of the GOP machine, this book reveals how a true Democratic resurgence faces steep barriers--barriers erected by conservatives who have worked to build their dominant position since the days of Barry Goldwater. "One Party Country does a good job of spelling out the GOP electoral strategy objectively and in detail, and without evidence of partisan leanings." 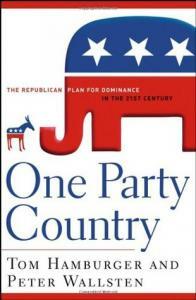 “For anyone who wants to understand why Republicans are winning elections and why they are likely to do so in the foreseeable future, One Party Country is a must read. —Lee Drutman, co-author of "The People's Business: Controlling Corporations and Restoring Democracy." "...solidly reported, lucid, and fascinating...highly recommended".